Iranian opposition supporters demonstrate at Tehran University's campus last month. 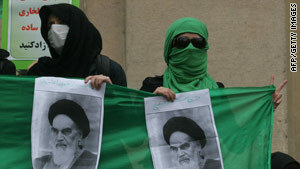 (CNN) -- A demonstration erupted Sunday outside an Iranian detention center, where 33 members of a women's group were being held following their arrest during a peaceful protest in a Tehran park a day before, a human rights organization reported. The International Campaign for Human Rights in Iran, citing an eyewitness account, said more than 100 police and plainclothes officers broke up a gathering of the Mourning Mothers in Laleh Park on Saturday afternoon. The group, formed by women whose children have been killed in recent anti-government protests, gathers every weekend at the park to call attention to the deaths. "They would not allow anyone to even sit on the benches or congregate," the organization quoted the unidentified witness as saying. "After about 70 mothers entered the park, security forces engaged them and started chasing them, grabbing them, and forcing them into police vans. They used a lot of violence and insults in the process." Thirty-three women were taken to the Vozara Detention Center, said Hadi Ghaemi, director of the human rights campaign. Later, nine women were taken to emergency rooms in two hospitals, but all nine were returned to the detention center late Saturday, he said Sunday. Families and other group members went to the detention center Sunday to demand answers to why the women were detained. Officials provided the names of those detained. Those gathered outside the detention center Sunday were alarmed about the health of those inside when an ambulance entered the center, Ghaemi said. The gathering turned into a protest, with people chanting, "Free the mothers!" Security forces attacked the crowd to disperse it, Ghaemi said. Two people passing by in a car who took pictures were placed in the detention center, he said. With Iran's tight restrictions on international media, CNN could not independently verify the report. The group's Web site had no details about the reported arrests. "No culture permits such violence to be unleashed against mothers," Ghaemi said in a news release posted on the campaign's Web site. "How can this government, which claims to have moral and religious authority, treat mothers who have lost their children in such a way? The Iranian officials should know that the activities of Mourning Mothers will not stop until their legitimate grievances are properly addressed." Mourning Mothers was formed after the violent crackdown on anti-government demonstrators following the disputed June 12 presidential vote, which re-elected hardline President Mahmoud Ahmadinejad over main opposition candidate Mir Hossein Moussavi. Since then, opposition activists and mothers whose children have disappeared or have been executed or detained have also joined the group. Among its members is the mother of 26-year-old Neda Agha-Soltan, whose chilling death in post-election protests was caught on video and became a powerful symbol for the opposition. The mothers are demanding government accountability for the deaths, disappearances and detentions of their children.